The sun popped out this evening, the first time in over a week. In fact I can’t rightly remember the last time we had a sunny day. The Northern Plains are wet, very wet. We don’t have the flooding some have but its still wet. Have the whole hay crop looking me in the face, and I’ve never seen so much hay in my life. It just keeps growing and growing. That’ll keep this cattleman out of circulation from people for a bit once I start. But there ain’t nothing better than more hay than a fella needs when winter comes knocking at the gate here in the north country. Got the twine all bought, the haybine and baler ready, now just to dry up a bit and then hit er. Now for folks that don’t know it yet this verse is coming from the Simplified Cowboy Version. From my friend Kevin Weatherby out of Kiowa, Colorado. 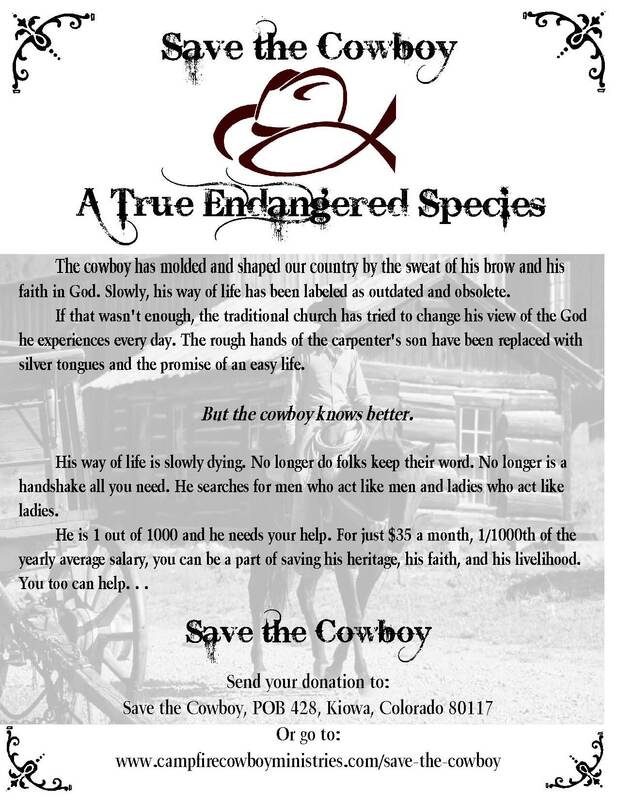 He heads up Campfire Cowboy Ministries and Save the Cowboy. Probably some of my favorite reading on the web, my kinda stuff. Kevin has the heart to reach the cowboy and give him the news about Jesus. Same as me. That’s probably why I get hooked on his writings. By the way, he writes allot better than this cattleman does. We both have a heart after God and want to share it with any and all who will listen. So now with the sun being out for the last hour after a long, long time without it, I’m gearing up to do what I do. Work out there in the great outdoors and I must say I love making hay. It seems once a person is started, day after day and really week after week I just get all calm inside. 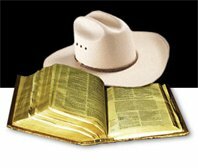 Take my cowboy pocket Bible with in order to take a quick read here and there through out the day. And it seems when a fella is going full snort I don’t worry about squat, just like the verse says above. It seems like hour after hour out there in the sunshine I just let God have everything and I’m as calm as any feller can be. Yep, I’m looking forward to it! And I ain’t all that afraid to ask God for what I need nowadays either. Once was, that’s for sure but the Bible says to ask. So I do! Simple, and I ain’t dwelling on it. The last day of May and it feels like early April around these parts. Cool, windy, very windy, hard to work outside in that. But the day is over now with the promise of a better one tomorrow. The last of the cow/calf pairs should go out to pasture tomorrow, finally that job will get done after the longest mud season that I have ever seen here. That’ll set me free somewhat, very little feeding to do all of a sudden! Had a great Memorial Day yesterday. Went to a small town parade, then the Memorial service at the town’s cemetery and then had a barbecue which settles in with me just fine. Drank a pot of coffee by myself, or durn near anyhow and shot the bull for a few hours. My kinda day off after a rough spring. Ministry things are really picking up. I’m excited to say the least, but there’s allot of work involved with all of that too. Finding a band or two is on the agenda, and that’s looking very promising. The word is out and sometimes that’s all it takes, (plus some prayer added in there, can’t forget that). Out here, working with beef cattle seven days a week has got to be one of the best jobs for having allot of time to just talk with God. A fella can literally go days without being bothered by anyone. Ain’t no cussing or swearing when a person is alone working. Just the sounds of nature that God put out here. Those are my favorite days, days when there’s no sound of machinery running, just the sounds of the breeze and the birds out in the pastures. Gives a fella allot of time to think. I ain’t getting any younger which was proven these last few days sorting pairs out in extreme mud conditions wearing knee high rubber boots that were never designed for human comfort. There’s some hurting going on where I don’t want things to be hurting after this past winter’s surgery, but it should be minor and go away in a day or two. But I like to think about the things of heaven while working here on this earth. Every day is a gift and a fella just gotta use it wisely. There ain’t nothing more important than eternity, and we will all know that for sure someday, and even while owning and running this cow outfit the eternal things are the things that keep me going. There is of course that most important thing, accepting Jesus Christ as Lord and keeping Him there as Lord. And there is spreading the love of Christ once a fella is a born again, new creation in Christ. There’s being true to your word cause it don’t make much sense supposedly believing in Jesus as your Lord and Saviour and then being a liar and acting like the world. I cannot imagine living out here, doing what I’m doing, without Jesus as the number one thing in life. Just can’t imagine it anymore. There’s some good promises in the Bible I tell you! And when you get right down to the simple Gospel, unlike what many say, its not a hard thing. The hard thing is when we start to take charge instead of just following the Gospel. When we have to do things to work our way into God’s favor, which by the way is totally impossible and every single human being on this earth will fail at it. Nope, only believe, believe in Him that took our punishment, surrender to Him, quit fighting Him, and all of a sudden a person is set free. Years ago I was my own man. Figured I knew allot. But lookin back I was heading at a roar for certain destruction and death. I was blind, blind as any feller can be. Used to cuss out preachers, oh I was a wonder! Figured how could them slick handed fellas that never do any honest work tell me how to live. Oh but I was blind. Of course that doesn’t change the fact that some of them preachers are really lacking in the working department but I can overlook that some what better nowadays. But the one thing I held in faith was that God would see us through, and He sure did that. It was rough, no denying that, but God came through time after time when everything looked like it was going down the tubes. Now years later I dwell on all of that. How God seen us through. I am so thankful that it wasn’t me that had to get us through it, God did the impossible so many times. Things that I could have never arranged. Yep, I was once blind but now I see! Jesus loves a fella and won’t let simple faith down. Jesus understands folks like me that make a living this way. Jesus was a country preacher, it was in the big city where trouble came. This has been an unusual spring in these parts. Fairly cool, really wet, with mud season lasting weeks longer than normal. Today was a challenge fixing a fence crossing a swollen creek. Normally we don’t have a problem like that this late in spring but this type of year happens every once in a while. But I’m not complaining because I know that the opposite is allot more miserable, drought, even the word sends shivers up my spine. When a person is almost living like a swamp rat there are certain benifits, such as grass that’s durn near belly deep, hay crops that are unbelievable, and of course, no shortage of water. One last problem though is to try and get the remaining majority out of the calving lot, which is seven acres and out to four separate summer pastures. Never had this problem before where the mud towards the main gate is so deep we can’t get the calves through safely. Well, we’ll come up with some cowboy logic in the next few days! Yep, a fella keeps on pluggin out here in cow country. Sometimes too wet, sometimes drought. Just when a person figures its all coming together nicely something will change and a person goes into emergency mode. But as long as a fella is in this world that’s the way it’ll be. But through it all when a fella has faith in Jesus everything else is of much less importance. Cause I know that in the end, which is really the beginning of something we can’t even imagine, things are gonna turn out alright! When we sign up with Jesus there ain’t no looking back. We’re finally with the right outfit! And that settles my nerves to no end! Cast Our Cares On Him! The one thing I’ve noticed, and I’ve noticed this allot traveling around to farms and ranches is the fact that most folks call themselves Christians. Fine and dandy. I’ll get the same response most of the time, “I was baptised as a baby, I’ve gone to church, I went through confirmation decades ago, so yes, I am a Christian. I ask if they think they are headin to heaven if they got hit by a car today, or gored by a herd bull, or just flat out fell dead on the spot for no apparent reason and the answer will be far less certain. Then there is some shuffling of feet, some looking down and not meeting a fella eye to eye. They don’t know. Well, the Gospel says different than what many a church goer have been led to believe and that’s why the Gospel is called the Good News. Not the maybe news, or if you are good enough news, cause I don’t care what anyone says, the Bible says there ain’t one person on this planet right now who is good enough. Don’t matter whose family your in, what church you or some grandparent of yours attends or attended. Nothing matters except one thing, and that is if a person believes that Jesus Christ took the punishment that they, (we), deserve, and we call on Jesus to be our Lord, we are saved. This little cowboy book tells it like it is! My truck always has a good supply in it for handing out to folks that want one. And they can be ordered here for free by just e-mailing me. That info is on the sidebar page link called Need a Bible. 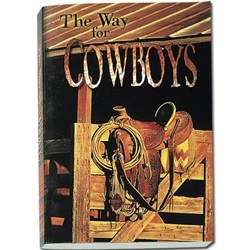 This little Bible called The Way For Cowboys is a wonder! The Good News is a wonder! Jesus said that His way is easy, His burden light. It ain’t some heavy load, its real life! He says to cast our cares on Him, not keep them for ourselves. Cast our cares on him and accept His offer for eternal life, it don’t get any better than that! Calves are hitting the ground on this outfit and today was a beautiful sunny day for once and all I had to do was watch from a distance, which makes life much more enjoyable by the way. Yesterday was bull hauling day, panned up a couple old herd bulls and loaded them up in the cattle trailer, separate compartments by the way, and hauled em to the salesbarn. The trip went good, they were unloaded, the papers filled out for country of origin and away we went home again. Looks like the place has calmed down considerably since those couple of trouble making bulls went to town. No bull fights today, no bulls bellering, down right peaceful around here. Sometimes them bulls would be tempting me to go out there with the 30-30 and put an end to em but I’m glad I didn’t cause the pay wouldn’t be the same as the salesbarn check…. Just came in from a 14 hour day outside. Started the morning with frost covering everything and by afternoon there was no need for a jacket. Sure is comfortable being able to shed the arctic gear! Getting back outside working just shifts my mind into gear with some good old faith matter too! Sometimes a fella goes for hours and hours out there by himself and it really helps when the day is beautiful out! But I was thinking while loading and hauling manure, (well, when you got a few hundred head of cattle there is a side effect called hundreds of tons of manure), I was thinking about this verse from my Cowboy Bible which is always handy. 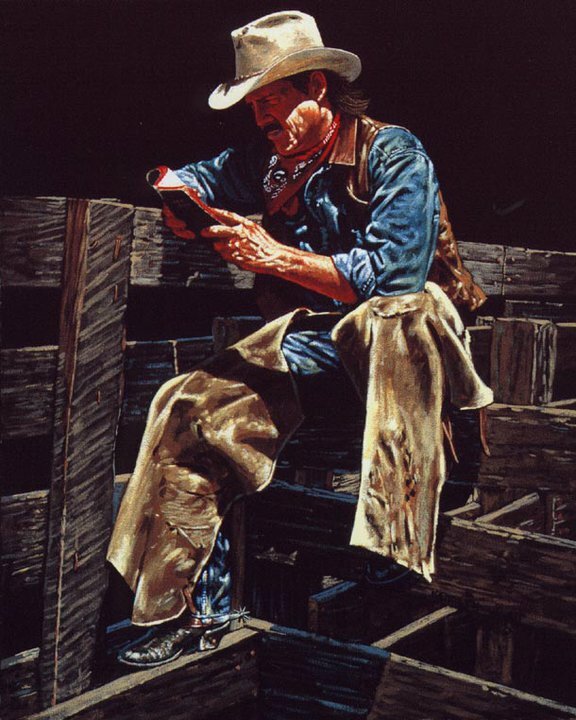 I kinda like that Cowboy Bible, small enough to carry around but I can still read it without reading glasses if I stretch my arms out far enough. Anyway, that verse says “anyone” and the old King James Version which I truly love says “whosoever”. Well, there’s allot of us whosoevers around and to tell the truth I always figured I would just go to hell where I belonged cause I truly couldn’t get anything out of church years ago. I’m talkin the dead letter church, all ceremony, all show. Where you first had to be good enough, which by the way, if they’d really follow that rule all the self appointed bigshots would have failed and the church could have been used for a salesbarn or a feed store or something important like that and useful. I love the Gospel because its for someone like me. Just a country fella, with the smell of manure on him from the cattle, (especially in the wet weather we’ve had the last couple of weeks). I ain’t fancy, just love raising and running a cattle outfit. Perfectly happy in what I’m doing. I wear Wrangler jeans and shirts, both working or for anything remotely considered social. Although my social is probably a barbecue under an oak tree. Well, that’s high society, my regular social life is at the feed store or farm and ranch supply store. But Jesus didn’t hang around all that much with the bigshots of His day, He went to the feedstores, fish markets, and probably what would have been a salesbarn two thousand years ago and preached and taught the day workers amongst the noise and smells of the place. Now they say, those who know more than me, that we should be like Jesus. So then how come we get all snotty and dignified when we think we’ve arrived in the faith? Hmmm? Would Jesus be preaching in a stiff, unloving church or would He be at the feedstores, at the co-ops, at the farms and ranches, at the rodeos and other places where the high and mighty do not hang around? My bet is that He’d be in the places that the regular folk are at. He’d be with the folks that are usually shunned by proper churches. He’d be hanging around a feller like me even! I love the Gospel, just love it. Where the regular folks can come to Jesus because He came to us first. Them Gospels in the Bible are chock full of Jesus hanging with the regular folks, the outcasts, the down and outers. And when we call on the Name of the Lord, He comes! Spring is trying to appear in the north country although it has a snoot full knocking winter back in these parts. I’m still generally doing little or nothing of importance with the cattle operation here except trying to get myself laid up again. I wonder if city preachers have to dodge mad cows? I doubt it but that’s what I did today and tonight this old feller is feeling it a bit. One of them things where a person is just fooling around the place with every intention of staying out of trouble, follow the doctor’s orders like a good boy, but fate has different plans. A heifer calved today in the barn yard and a barn yard in the beginning of the melt isn’t the cleanest place in the world. The heifer was good with its calf but a little bewildered as is sometimes normal. Plus add allot of high strungness in the equation and a feller has the makins for a good wreck. With a couple inches of greasy manure on top of a foot of pack ice its the very place that old doc told me not to be. But as I said, fate was calling and I know the rules and all but there comes a time when every rule gets thrown out the window and a man has to do what has to be done. Had to get them separated from the rest of the crowd and it was a circus. That heifer could have out run a race horse but finally the calf was in a separate pen, I was at the gate and something told me to stand to the side away from the gate and that heifer came barreling through and just blew that heavy duty steel gate open. Thank the Lord I wasn’t in front of it! Tonight I’m a bit sore because of it all, all the dancing I had to do on the greasy ice, but that’ll pass in a day or two. Yep, God is good! I look forward to getting back into the swing of things because one thing I have discovered, I ain’t good at sitting around the house. I thought I would write, get ministry things together, do all sorts of things but I soon discovered I operate best when I’m running this place at a full roar. That’s when I get inspired, that’s when I go full snort into anything. That’s when writing is easy. But even with me complaining and all that God has different plans and does keep me busy even when I don’t want to be. More and more opportunities develop daily with the future of this ministry, even when I figure there shouldn’t be anything happening because I’m cooped in the house so much. I reckon its time to get back on the road one of these days and start my rounds too. Then a fella comes alive! There’s the Word of God to spread and there’s nothing better than doing that for me! So for tonight I’ll just take er easy, done enough rule breaking for one day. Last night here in the north we had some snow again and this morning the roads were flat out terrible. But its March and by early afternoon the roads were perfect and pepper dry. How I can see the changes compared to the month of January! I’m tired out a bit tonight, but happy. Got to get around a little bit today on the place. Didn’t really do anything except feed the barn cats and fed and water the chickens in the old chicken coop. But it does a man good to get out and do something after being locked up in the house for over two weeks. Its just not in me to be in the house. Not a house type of guy. Oh, I like being in the house every day during normal times but I always head back out for this or that, never have I been confined to the house for this long in all my born years. I’m flat out looking forward to spring work, I’m flat out looking forward to calving season and then pasture season, plus all the hay making I do all summer. There’s allot to do on an outfit like this, believe me, but its my life and that’s what I do, and enjoy. I farm in order to get enough feed to winter the hundreds of cattle over, if I didn’t have to do that I wouldn’t farm all that much. I guess I’d rather just work on the cattle side of things. But reality is that allot of cattle take a lot of feed so that’s why I do it. Around these parts things have changed over the years and I tell you there’s allot of places with beef cattle and there’s probably even more small outfits with horses. Every where a person looks there’s horses nowadays, which sits OK with me. The other day, a week after my surgery I had to go for the one week check up to see if it was all OK or if I was falling apart and I’m pleased to say that the verdict was everything was OK. Well, the county seat where the hospital is located is twenty some miles away. On the way home along side of the old Mississippi River we stopped in at a small town so my driver could go into the butcher shop and buy some sausages and stuff. I elected to stay in the car cause at that time I didn’t want to push it walking around and stuff. I sat there for a while and was parked on the opposite side of the street. For some reason I looked on my side of the street to a building that had always been a cafe but wasn’t doing all that hot these last few years and I was in for a shock that almost had me yelling a healthy YEE HAW! The former cafe was now a saddle and leather shop and I never even knew it till then. I made a vow to the moon and starts that as soon as I got enough snort to get around safely by myself I would give this establishment a visit. Well, I haven’t made it yet but will shortly when I feel good enough to get around and still have the time off. Since then I’ve been inquiring about it and now I really want to go. Surprised the dickens out of me to see my kinda store open up almost in my home town! This is a good sign but no wonder with all the horses and small outfits around that there wight be a place for a business like this in the immediate area. God is good and this is the culture I love. I’m a salesbarn type of guy, love the livestock business, love the people and all. There is a place for this western ministry around here. I look in the papers and there’s horse sales galore around the region, there’s salesbarns all over the place. The pulse of the whole area is animal agriculture. Its one of the main hobbies too. No wonder God called me a long time ago into this and I must admit, I always figured He did wrong cause this wasn’t what a person would call exactly a western style area, until now. The last twenty years there have been steady, major changes and I’m all for em! God is good. God knows what is needed. God picks the foolish and I guess I’m at the top of the list in that catagory, to carry out His plan. Yep, I’m raring to go. Now I ain’t got a church building and I don’t know if I’ll ever have a church building but it don’t make me a hill of beans difference if I do or not. I love talkin one on one, I love preaching to crowds. My style is different and it hit me today that when I preach to a crowd its almost the same as how Glenn Smith used to preach. And it sure ain’t intentional, it sure ain’t something I practiced, its just that I’m a down to earth person, from the land, that knows the livestock industry, and this is what naturally comes out. Maybe I’m not some stiff necked, serious type of preacher, (well they officially call me an evangelist), and I have no problem talkin like the regular folks because quite simply I am one. Lord, how I love to do that and see em come to the Lord, to see people change, to make em laugh and to convict them in the next breath. To see the change come over folks that were Gospel hardened is one of the greatest miracles there is! OK, no teaching tonight, no big revelations, just dwelling out here in the country on a March evening. I’m just thanking the Lord for His goodness! Our mission is to preach the Gospel of Jesus Christ and to disciple believers in their personal and spiritual growth. There! Just coming up with some simple stuff for around here. Simple and to the point. It might have a very rural flair, but its not fake, because I can’t preach the Gospel any other way. Well, its a Saturday night here and I’m still on the mend. Had a scare today on this outfit. Around two in the afternoon I got a telephone call and was asked if I seen any of our cattle running past our place. I looked out the window and no I did not. 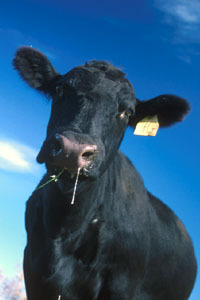 But the caller, (a family member), said a pen of steers spooked and got loose. Great! Here I am, about as in shape as a slug, trying to recuperate from some pretty big cutting surgery and I have to go and chase some wild eyed steers which I had no part in spooking. Grr! Well, luckily the steers that busted down a heavy duty gate didn’t hang a left and head down the road. They stayed with in the outer fence and ran over to have a look at the cows with a fence separating them. Plus the snow was so deep there those steers couldn’t get much momentum to jump over to the cows. More and more help arrived and we closed off the outer perimeter gates and then it was just to get them into a main corral which they willingly did Praise the Lord! By the time all the action was done this old cattleman was done in and I hardly done anything. Oh Lord, let the recovery continue till I’m back up to snuff! So as I sit here tonight thanking the Lord I didn’t get tore apart today in the excitement, I’m putting together a little something for church tomorrow. Seems they want to get me back up there pronto and who am I to say no! I’ll be doing some preaching on the Holy Ghost Cattle Sale which was posted on the blog “Heading Towards Home”. Talk about a story of the Lord answering what was commited to Him. Yep, sometimes things don’t go according to our plans, but does that mean that the Lord is looking the other way. No. He’s looking the right way! He knows the best out come even when it might not seem that way to us. He sees eternity, we don’t. Most of the time we can’t see past the end of our noses, let alone the big picture. Trust in God, trust in God, trust in God! God is good, God is all good, there is no bad in God, none what so ever. So no matter how it looks, no matter what I see I’m going to trust in Him. And when that day comes when I cross that River and head into eternity that trust will be well worth it! Windier than the dickens today on the northern plains. March weather, blowing, possibly snow drifting, but spring keeps getting closer and closer. I was out checking the shape of the cowherds a while ago and spring can’t come soon enough, the snow and ice pack in the feedlots and corrals is making the cattle a whole lot taller lately. The top boards don’t seem all that high anymore. On the average I would say that the pack ice is a couple of feet thick. Oh well, reckon one of these days the south winds will blow for a few days and things will start breaking up. Been laid up here mostly in the house, feeling better and better as each day goes by. Counting the days till I can return to some real work. I’m thankful that we calve later here on this outfit. Learned that years ago, don’t pay to fight the weather, I’d rather live with it smoothly, the less work involved the better for the same outcome. I love it when a calf is born during weather where it doesn’t have to scramble to just stay alive. No night checks, no freezing calves, no freezing cattleman, yep, I like it allot. I guess that goes against the grain of those who are the experts in the cattle business in the north country but I’ve been around longer than many of the experts, and am still in operation too! I reckon God had it planned for me to be a cattleman, cause it was in my blood from the very early days. There ain’t nothing I’d rather be doing cept for preaching the Gospel, and raising cattle and preaching go hand in hand for this fella. No, I ain’t some educated man when it comes to the Bible either. I just read it and believe it. Simple. Don’t really try and figure it out, cause men allot smarter than me have tried and failed, but those who believe it soon find that its the very power of God, a power that is always available to them who only believe. Must be why the simple can explode with so much of God while those who are all high tuned, educated till they can’t even remember all their degrees, basically have a blah life. Out here a fella can see God moving in everything, and I mean it! Especially in that season when things are reborn on the northern plains, when the southern birds return, when the grass starts to green, that first spring thunderstorm and the grand beauty of the cloud formations that sometimes go with it. The creek running through the pastures is teeming with fish making their yearly spawning run. New born calves all over the place and when the sun is setting on those spring evenings the calves do what I call the calf dance, they gang up, go running like the wind kicking their heels in the air and having a blast. How could I not preach the Gospel when I’m surrounded by His presence? How can I not tell others about what He has done?